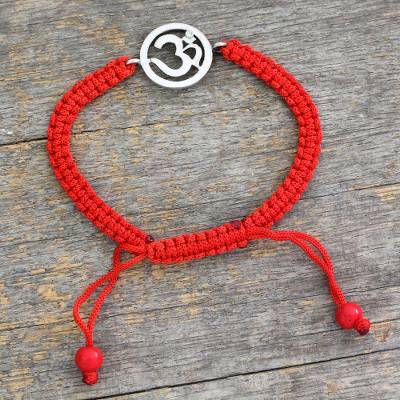 Diamond charm bracelet, "Solitary Crimson Om"
Hema honors inner peace and meditation practices with the inspired design of this bracelet. It is centered by a sterling silver medallion featuring Om (also ohm or aum) written in Devanagari. The sacred incantation is intoned at the beginning and end of reading the Vedas, as well as before a prayer or meditation. This Om is studded with a solitary diamond (.01 carats). The bracelet is braided by hand and can be adjusted to the desired length. Pendant: 0.2 cm H x 1.8 cm Diam. You can find diamond charm bracelet 'Solitary Crimson Om' by Hema in jewelry categories such as Yoga Bracelets, Diamond Bracelets, Glass Bead Bracelets, Silver Bracelets, Sterling Silver Bracelets, Nylon Bracelets, Rhodium Plated Bracelets, Braided Bracelets and Charm Bracelets. Enjoy exploring these sections for other Novica treasures.